Viewer as in "view formatted content", Markdown as in CommonMark. See https://stackoverflow.com/questions/9331281/how-can-i-test-what-my-readme-md-file-will-look-like-before-committing-to-github for wider version of this question. Though not strictly being a viewer, I can recommend ReText here – which I'm using myself on Ubuntu, and am pretty satisfied. normal program, not a browser addon: Yes. Written in Python, and easy to deal with. simple and lightweight: Yes. On its own, it comes with the basics – and you can add more (like support for specific Markdown dialects as Markdown Extra or MathJax if you need. using the menu, go to Edit › Preferences, and check "Restore live preview state" under "Behavior"
Now, when opened the next time, the "Live Preview" is switched on automatically. Alternatively, you can open the "real preview" (without the editor pane) by either clicking the "Preview" button, or using the keyboard-shortcut Ctrl-E.
For more details, also see my answers here and here. 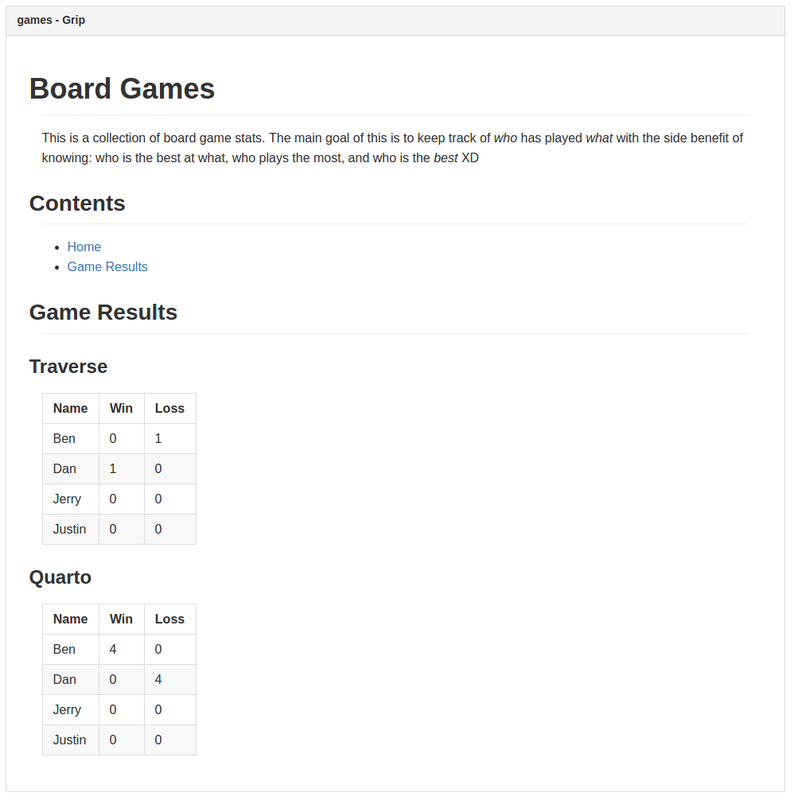 Here is an example of the HTML output. I find Retext fine as is answered but I do have digged out a few MD editors for linux that are more or less better than the solution suggested. If more they have additional features, and less so they are fast. Springseed If you needed a note taker This one does the job Beautifully. Atom works nicely out of the box - just open the Markdown file and hit Ctrl+Shift+M to toggle the Markdown preview panel next to it. It handles HTML and images also. 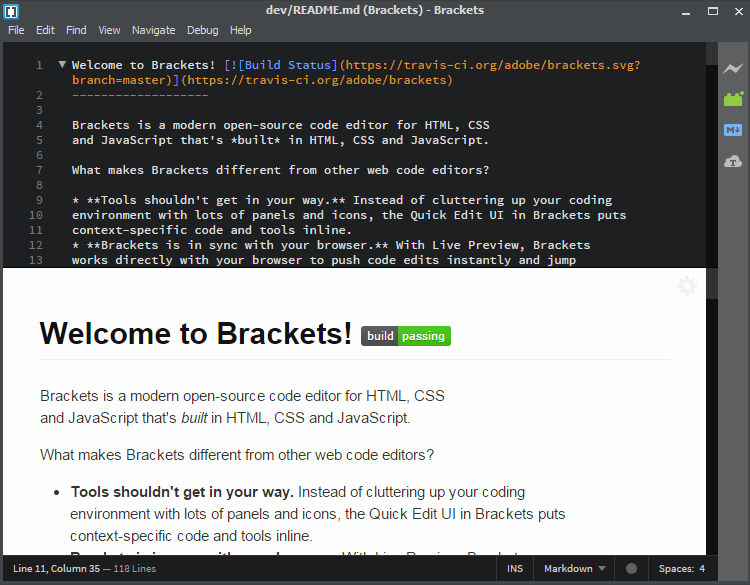 Brackets is an open-source free-of-cost text editor sponsored by Adobe. See Wikipedia. 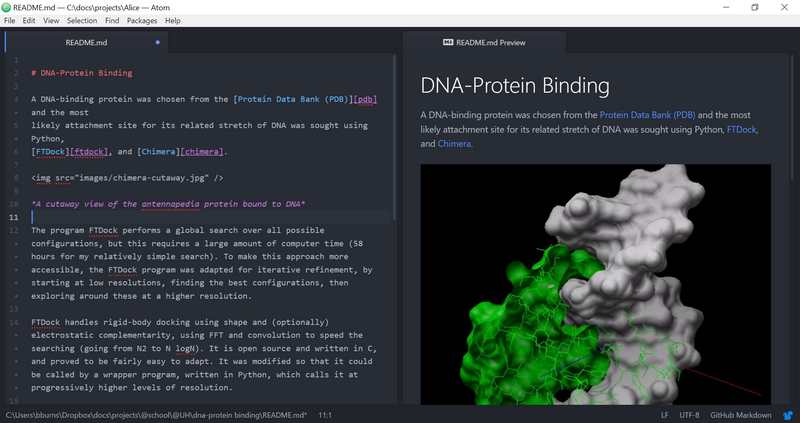 Live preview of HTML+CSS is built-in. 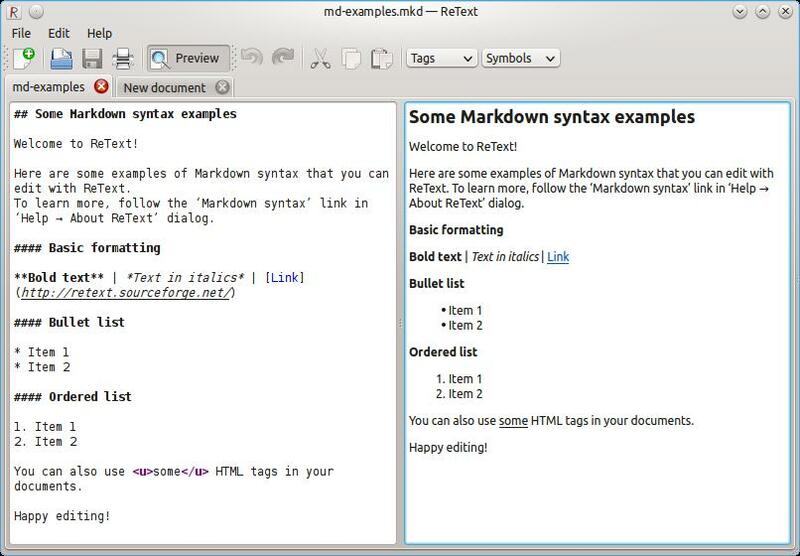 ➠ For live preview of Markdown, use the Markdown Preview extension by gruehle. This question was asked in 2015. Meanwhile Visual Studio Code has become quite popular. It is available also on Linux. VS Code has good Markdown support built-in, and since 2017 or so it has a Preview-Mode for Markdown (sync'ed split windows). For screenshots, scroll down on the page I've linked to. Markdown support can also be enriched with many extensions, e.g. "markdownlint". 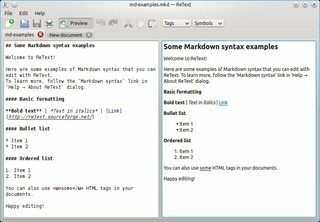 Markdown Viewer can be installed from Ubuntu Software. It is a command line tool that generates a temporary HTML file and open it in the browser. Not the answer you're looking for? Browse other questions tagged ubuntu markdown or ask your own question. Are there any Markdown plugins for TWiki?